Join us in the cafeteria from 9:45-10:45am on Sunday mornings. Topics vary from season to season and include Scripture, prayer, Church history, saints, and Christian living. DVD’s allow us to learn from the best Catholic speakers, and discussion times allow us to get to know our parish family. Join us any time to enjoy coffee, refreshments and fellowship between the Sunday Masses—you do not need to reserve ahead of time. 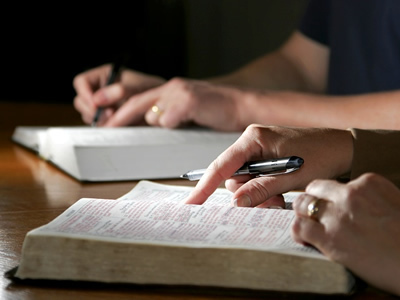 Small groups meet in homes to study the bible or other faith-related topics. They typically meet twice a month. Different groups meet on different days and times of the day. For more information, contact Mary Ellen Jackson at mjackson@charlestondiocese.org or 803.642.2676. We meet on Mondays from 12:00-1:00pm downstairs in Smith Hall. All are welcome to attend. Bring your lunch and join us. For our current book study, please see the Sunday bulletin. For more information, contact Kathy Monahon at kmonahon@atlanticbb.net. This group meets in Smith Hall Thursday morning at 11:15-12:30pm and studies a faith-related topic; currently we are studying the Letter of James and the Catholic Epistles. For information, contact Mary Ellen Jackson at mjackson@charlestondiocese.org or 803.642.2676. RCIA is open to all who wish to learn about the faith. It meets Tuesday evenings during the school year.For information here or contact Mary Ellen Jackson at mjackson@charlestondiocese.org or 803.642.2676.